Shortly after returning from my Appalachian Trail thru-hike I was asked to contribute a feature article to a fitness magazine. The focus was to be on the sport of “Fastpacking” and since I had just hiked four and a half months on the AT, maybe I’d be able to give a little insight into the world of backpacking. Fastpacking as a sport is a mix of ultra running, mountain racing, ultralight backpacking, and a little bit crazy. I wrote about my own experiences, strategies I learned from fellow hikers, and my dreams of how I’d like to attack my next long trail, as an ultralight, ultrafast hiker. 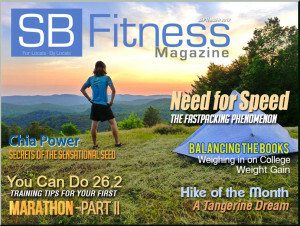 I was asked to include pictures from my trip and the photo of my campsite in Vermont became the cover of this month’s issue of SB Fitness Magazine. A BIG Thank You to SB Fitness Magazine for including me in the publication! MAD PROPS! I think our 3.5-hour, 14-mile jaunt was the kipper.